Marketing has changed dramatically over the past decade, and continues to evolve as new marketing technology, tools and techniques are constantly introduced. Marketing Managers that provide complete marketing backing for businesses (a.k.a Unicorns!) need to have a creative side as well as an analytical side. This way they have the complete skillset to create engaging digital and offline marketing campaigns that are trackable and in line with achieving your business goals. 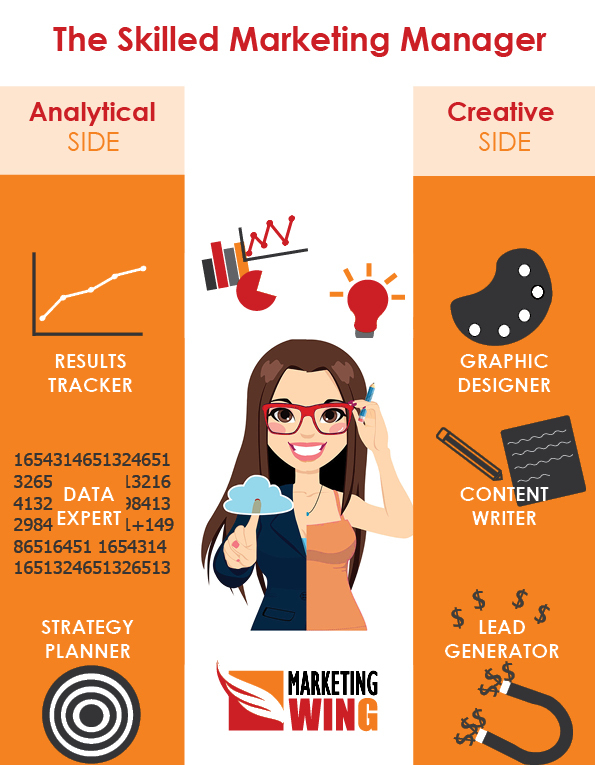 Here’s an infographic that summarises some of the traits to look for in a Skilled Marketing Manager. Take a read of each skill in detail further down. It’s all well and good to create marketing campaigns, however unless your Marketing Manager sets targets and tracks results, there’s no way of knowing how well your marketing is doing. Tracking results helps to pinpoint aspects of a campaign that have exceeded expectations or may need tweaking or improvement. Without tracking results, your Marketing Manager could be wasting time and resources on strategies that may not be the best option for your business. With a smorgasbord of data now available, knowing what information to analyse and when is part of a Marketing Manager’s weekly or monthly routine. Finding out information and statistics on your customer base and rivals is par for the course for any Marketing Manager. Interpreting the data and making use of interesting shifts in behaviour ensures your marketing remains responsive to consumer needs. A skilled marketing manager will do their research and formulate a solid plan before jumping into any type of marketing campaign. Whether it’s an email campaign, website or digital advertising project they’re working on, without a plan and course of action, there’s no thought or rational process to follow. Without proper planning, your marketing can go off-course and fail to hit any targets. A skilled Marketing Manager should demonstrate the creative flair in designing stunning, attention grabbing visual content. You want your marketing to appeal to your audience, reinforce your brand strategy and leave a lasting impression. With an artistic Marketing Manager at your disposal, your marketing collateral will remain impressive and relevant, and more likely to generate the response that you want. The ability to use creative writing or masterful copywriting skills to create content is paramount in today’s inbound marketing driven environment. Customers search for information everyday so you want your messaging to talk the language of your customer and tell a story about your brand. Having a creative content writer at your beck and call means that you’ll always be communicating brand or product information with your customers in the best possible light. You need your messaging to persuade and appeal to your target audience at every opportunity. A skilled Marketing Manager needs to use a number of initiatives to generate leads. They should be in tune with all the traditional avenues and digital options available, and determine what methods are best to invest time and money in. Using best practice techniques for lead generation is also imperative to ensure that strategy implementation is successful. 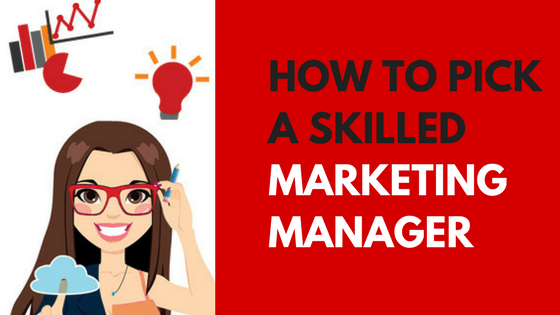 Any skilled Marketing Manager would agree that their role has evolved into a juggling act of balancing analytical skills and creative skills. When you outsource your marketing to Marketing Wing, you have the assurance that you’re always serviced by a seasoned Marketing Manager who exhibits all of the above important skills. Your Marketing Manager is also an Australian Certified Practicing Marketer, assessed and reviewed by the Australian Marketing Institute. This gives you the peace of mind that your Marketing Manager keeps abreast of new marketing tools and techniques, staying on the pulse of the ever-changing marketing landscape. Read more about our outsourced marketing manager services. It’s the perfect solution for those businesses that either don’t have the resources, space or workload to warrant a full-time, in-house Marketing Manager. Our outsourced Marketing Manager solution provides companies with flexibility and will help you save staff and overhead costs. Chat to Marketing Wing today about outsourcing a skilled Marketing Manager for your business. We service Perth small and medium size B2C and B2B clients across all industries.